Should the outer front wheel bearing easily slide onto the end of the stub axle when both are new? I measured the bearing inner diameter to be about 0.0005" larger, but this doesn't seem to be enough clearance to slide it on by hand. I would like to adjust the hub (10ft-lbs then back off 1-1/2 to 2 flats) prior to installing the seal, but am concerned I will not be able to accurately set or remove the outer bearing if it is worked in place by tightening the slotted nut and washer. FYI, the inner bearing measures 0.001" larger, and I have no problem sliding it on. Bearings are Timken and stub axle is from TRF. 1.5 to 2 flats is the wrong adjustment unless you have front drum brakes. The workshop manual was not updated (like with so many other things), but you can see the change in "Practical Hints". Final spec was .004", which should be achieved by backing off only until the slots line up for the first time. But with new components, it may be necessary to sand down the back of the nut to achieve that. https://en.wikipedia.org/wiki/Engineering_fit plus the two ISO references at the bottom. Or if you prefer, the simple answer is that it is acceptable to require some gentle encouragement to install the outer bearing. You can still check the clearance even if the cone doesn't move back out immediately, and it will move when things get hot enough to take up the cold clearance (if not before then). Thanks for the information Randall. I installed the left hub by turning the slotted nut with a socket wrench to work the bearing onto the axle, but the nut bottomed out before the hub became difficult to turn! Upon further inspection, it appears the new stub axles have a taper down to the threads that prevent the D-washer from fully seating (see picture below). Measured by caliper, the difference is roughly 50 mils. Do you think it would be okay to grind the inside edge of the D-washer? Any other options? The D-washer is what holds your wheel on. I would not grind on it. One or more of your parts is/are off. You need to study them against the original parts and replace the ones that are wrong. It’s too important to start modifying when you don;t understand why you have to modify. I would be tempted to relieve the end of the axle just a bit, so the washer will fit where it should. But unless you absolutely have to have it tomorrow, a better idea is to contact TRF and ask what they are going to do about selling you a part that does not fit. Although it may take a while to resolve, I have always found them to be reasonable; as long as I didn't try to modify the part to fit. Last time it happened to me, Albert confirmed that their entire shipment was bad (and there weren't any others in stock). Took a couple of weeks for the next shipment to come in, but they sent replacements to me gratis. The D-washers and slotted nuts are original. I don't know, but maybe new washers are designed to work with the taper on the new stub axle. I'm not sure what else there is to compare. I understand the issue to be a taper at the stub axle threads that will not allow the D-washers to go deep enough to set the proper float. I verified this by measuring the difference (50 mils) between the old and new. I also was able to properly set the float using a standard round washer large enough to fit around the taper. If this indeed is the issue (please correct me if you think it's not), do I have any options other than trying to find another stub axle design that allows full D-washer engagement? I will contact Albert. Is it possible to remove the stub axle with the vertical link mounted? I'm not too excited about dismantling the front suspension I just built up. BTW - I was going to order the bearings from TRF, but found that Rockauto had them much cheaper. It was the first time I replaced bearings on my TR4a, so I followed the same procedure as Randall listed above. The only catch was, how tight is “finger tight”? I also wasn’t keen on filing the back of the nut. So I tightened the nut with a socket in my hand, until it felt snug, then backed off to the nearest hole. I then marked the position with a dab of white paint on the nut and shaft. Then I pulled it all apart, packed it with grease, installed the felt seal (after squeezing all the excess oil out), and reinstalled matching up the paint marks. However when I got it back on the road, it pulled to the right under braking. Turned out the left hub was slightly looser than the right. So I tightened the left nut one more space, and that fixed it. I checked them again after driving a few weeks, but they still felt good. Yes, the stub axle will come out with the VL on the car. Since you just installed it and haven't driven the car, I expect it will come out fairly easily. But mine had probably never been off since new, so I took the upper joint loose and swung the VL down for better access to the back (with a BFH). Still easy, all the A-arms can remain in place, you just undo the nut that holds the upper ball joint to the upper arms and swing it out/down. Don't lose the spacer tho. I'm fairly certain TRF did not change the design to require a different D-washer. That's not their style; they try hard to supply parts that are as close to original as possible (tho obviously it doesn't always work out that way). Plus I bought some new washers from them just a few years back and they were cut just like the originals. IMO what you are seeing is clearly a manufacturing defect and should be treated as such. Carefully using a Dremel and abrasive wheel to cut the area down just a bit is probably not going to weaken the axle significantly; but if the manufacturer cut that corner, they may have cut other corners as well. Originals were high tensile, almost spring steel (they do flex quite a bit in service), so (for example) someone may have substituted a cheaper steel alloy or skimped on heat treatment; without considering the ramifications to the end user. What's the spec for the radius where you see a fillet? I don't know, but I do know the original parts fit and what you have is not to spec. Thanks Jim. Those are the Timken bearings I used, and I also ordered from RockAuto. They have been significantly cheaper for transmission, rear axle, and front hub bearings. I will keep your comments in mind when I set float with different stub axles. ...but if the manufacturer cut that corner, they may have cut other corners as well. Originals were high tensile, almost spring steel (they do flex quite a bit in service), so (for example) someone may have substituted a cheaper steel alloy or skimped on heat treatment; without considering the ramifications to the end user. I find this comment concerning Randall, but what can I do other than purchase parts from a "reputable" place and hope they work like the originals? It would be nice if our vendors did a better job ensuring the parts they order meet specification, instead of just tossing them in a box for shipment to the customer. I got those same Timken bearings from RockAuto yesterday, and installed them this AM. They came in Timken boxes and had Timken on the bearings...made in France. Cost about $90 for both sides, bearings and races. I find this comment concerning Randall, but what can I do other than purchase parts from a "reputable" place and hope they work like the originals? Return them when they aren't right. That was exactly my point. TRF et al want to sell good parts (IMO); but there is no way they can inspect every one. It is up to us to let them know when there is a problem; and give them a chance to fix it. As a side comment, TRF also offers uprated spindles that I'm pretty sure are made here in the USA. Designed and initially produced by someone who raced a TR4 quite successfully, to address a weakness in the original design. They also come with a spacer kit that makes the overall assembly much stiffer, reducing flex. Have you measured the distance from the inside of the washer to the inner bearing of the old/new as a comparison. Also...just a thought...are you certain the new stubs pulled in completely? 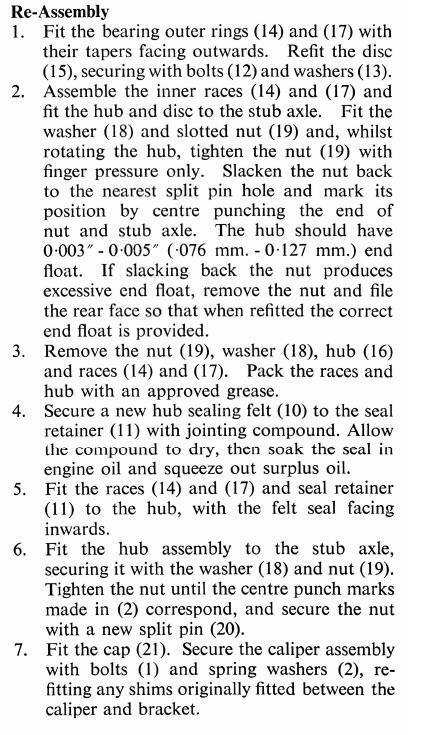 If so, I would lean towards using a shim washer inside the index bearing race rather than modifying the threads/nut/washer which have the important job of holding the wheel on the car. I decided to grind down the fillet on the new stub axles so they look similar to the originals. It was actually quite easy to do using a small file with a smooth edge. I think the modified part turned out well, and I had no problem setting float. I understand there to be a safety component to this, so please let me know if something looks suspect from the pictures below. I felt the risk was minimal since I'm only removing material that should have never been there to begin with. I also informed Albert at TRF so he can take appropriate action on existing and future stock. That new stub axle has a machined ridge. That is not right and has me wondering if some processes in the manufacture were skipped on your axles. Look at the difference in the ground bearing surfaces between the old and new. The new is much more coarse than I am used to seeing. Given the above, combined with the obvious problem with bearing spacing mis-machined into the stubs, I would not use the new axles. There could be issues with material, heat treating, and stress relieving that may also have been overlooked. If it fails you loose the front wheel with no warning. I am sure you have heard the term “Jesus bolt”. This part is a perfect example of why the term came into use. I guess I have a decision to make. Albert at TRF said some of his stock was not machined down far enough like mine, but he believes the manufacturer probably just missed a step. He said they have used the same supplier for a number of years. All of his stub axles do have a ridge, but interestingly, the ones shown on other vendor websites (Moss, BPNW, Rimmers) also have a ridge. I'm not sure where I can buy one that looks like the original - if it's even possible. Honestly, this thread has made me a little bit paranoid, so I might just get the uprated kit. I plan on the uprated kit. I think one of the main reasons to spend a little more money to get an uprated part is that they're paying closer attention to tolerances and machining for the extra you're paying for the part.